Jill and Web are the proprietors of LooLoo Design, an antiques business with roots in the 19th Century and a vision for the 21st. Jill has taught art, worked in a NYC gallery, and has years of experience in appraisal and estate sale management. Web has degrees in Journalism and International Business and has authored numerous articles and several books on American architectural history, decorative windows, and builders’ hardware. 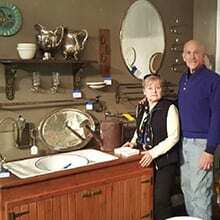 Web and Jill buy and sell everything old and unusual, but over the past 2 decades, their main interest has been vintage baths and kitchens. 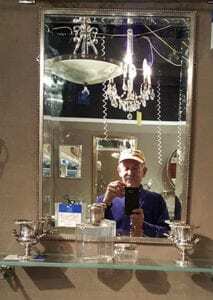 They have an impressive inventory of tubs, sinks, showers, and fine bath accessories such as mirrors, towel bars, and bath shelves. You can browse their inventory on line, at the Antique and Artisan Gallery in Stamford, CT.
LooLoo Design Estate Sales has managed many on site events for both residential and business clients including the Scalamandre Silk Company of New York and Belcourt Castle in Newport, RI. 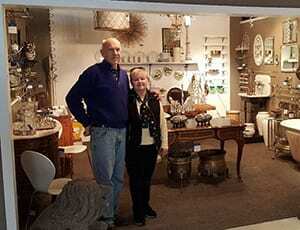 LooLoo Design Auctions runs live Internet bidding events for special collections and quality antiques. 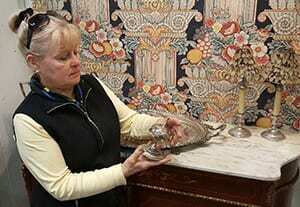 Jill & Web share their lifetime of experience via formal and informal appraisals of antiques and personal property and are design consultants for new buildings or renovation projects. The LooLoo RV is often on the road and has traveled cross country several times. Call 800.508.0022 or Contact Us any time. Web and Jill Wilson live in Portsmouth, RI, just north of Newport. You can visit their inventory by appointment. LooLoo Design also maintains gallery space at the Antique and Artisan Center in Stamford, CT., one of the best group shops in America. 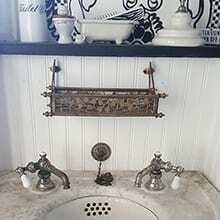 LooLoo features mansion quality vintage plumbing and accessories along with selected antiques and vintage furnishings. Stamford is worth a visit no matter where you live.